Dividend Aristocrats - Get the Best Free Guide to the Dividend Aristocrats Now! Meet the Dividend Aristocrats. Decades of consecutive dividend increases are great, but they only matter if the underlying stocks have actually outperformed the benchmark on a total return basis. And that is exactly what we have seen from the Dividend Aristocrats index/ETF over the past decade. Yes, its a 10 year track record of out-performance, it indicates that owning dividend aristocrat stocks is better than holding the S&P 500. The performance for the actual index rather than the ETF is even stronger, given the index has no fees. Not only has this basket of stocks outperformed the S&P 500, it has done so with a lower beta! Just so we’re on the same page, beta is a measure of volatility comparing a subset of of stocks to the broader market. Lower is better. Based on this track record we know that the dividend aristocrats are a great place to pick up some good companies and an excellent starting point for additional research into high quality dividend stocks with strong histories of returning capital to shareholders. Check out our better dividend portfolio we are building! While the chart below demonstrates that holding all S&P dividend aristocrats outperforms the market, Smart Dividend Stocks seeks to pick the best dividend aristocrat stocks out of the bunch to try and capture even higher returns. The dividend aristocrats are an elite group. It’s not easy for a company to join the Dividend Aristocrats List, which is exactly why there are currently only 53 dividend stocks that qualify. These S&P Dividend Aristocrats are large businesses across all the major industry groupings, but they have one thing in common, a large moat with a huge brand that has allowed them to continue profitable operations spanning decades. Everyone should be familiar with most of the companies on this list, such as 3M, McDonald’s and Johnson & Johnson. But there are also some less familiar names that make the list as well, including Aflac and Genuine Parts. Our Dividend Aristocrats List tracks all 53 qualifying stocks, and gives you the financial metrics that matters. S&P Dividend Aristocrats are coveted by investors because of their strong business models and consistently increasing dividend payments. Smart Dividend Stocks has examined every dividend aristocrat currently on the list and compared them across standard metrics such as P/E and EV/EBITDA. Average yield for the Dividend Aristocrats is ‘just’ 2.5%, which seems low given the minimum 20 years that the company has raised its dividend. The reason for a somewhat low yield is that companies have raised dividends along with earnings, and the value of the company increased in step. While a basket of dividend aristocrat stocks may not bring you the highest yield, it does bring high quality businesses that tend to be safe investments. The average payout ratio for the group is 81%, meaning just over half of the companies earnings are used to pay dividends, this is a reasonable level. Leverage and interest coverage are both very strong for the group, in fact at 1.5x Net Debt/NTM EBITDA the group is actually under-levered and would obtain a more optimal capital structure by adding debt at current rates, perhaps choosing to repurchase shares with the debt. Most of these stocks score well on our Dividend Safety Score, often in the 80% or higher range. As we would expect with a highly coveted group of strong companies, the valuations are not cheap, but you get what you pay for. The average P/E for the group is 19.6x and the average EV/EBITDA for the S&P Dividend Aristocrats is 13.1x. While the average is high, there are still some bargains within the group. Most of these stocks will continue to raise their dividends in the coming years, but some are at risk, they have low Dividend Safety Scores, and are likely to cut their dividends. 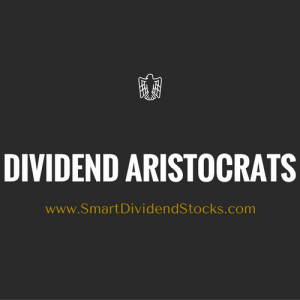 Below is the complete 2018 Dividend Aristocrats List, or check out the top 10 high yield dividend aristocrats. * Data priced as of August 2018; we cannot guarantee accuracy.